Adventures by Disney added a new Adventure for 2013 – Scotland: A Brave Adventure. I was very excited when I heard about it and then even more excited when I heard Deb Wills from All Ears wanted to get a group together to do it. I have been on an Adventure by Disney before and thought an Adventure couldn’t get any better but going with a group of friends would make it even more fun. By the end of an Adventure you feel like one big family anyway so even if you don’t go with friends you will have plenty of new ones at the end. Scotland: A Brave Adventure is the first Adventure that is based on a Disney Movie. We are going to be visiting many of the places that inspired the Pixar team and we will feel like we are walking in Merida’s footsteps. We are even getting a daily video visit from Mark Andrews, director of Brave. Our Adventure starts in Edinburgh. 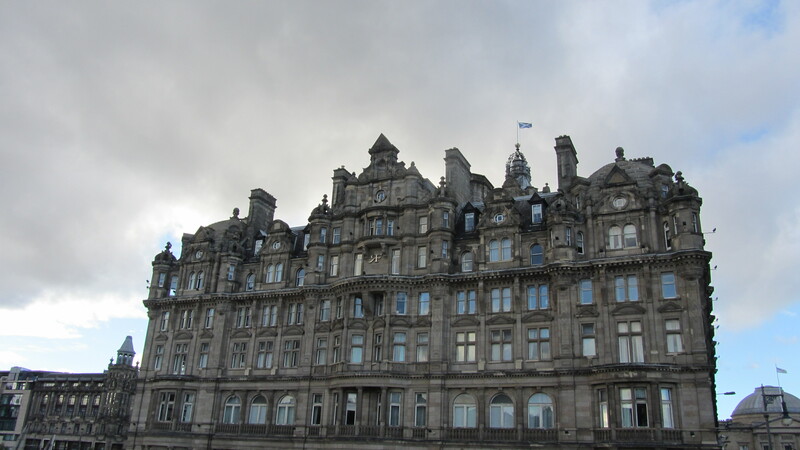 We checked into The Balmoral, which is an amazing hotel and our home for the first 2 nights of our adventure and is also going to be home for our last night of the Adventure. The Adventure kicks off with a reception dinner where we get to know our guides, Dusty and Hanneke, and our fellow adventures better. Day 2 is Bewitched in Edinburgh. After a nice breakfast it was time to meet our local Blue Badge guide for the day, David MacCrae. He was not only informative but also a very funny guide. Our first stop with David was The Palace of Holyroodhouse where the Queen comes to visit. Our next stop was the National Museum of Scotland. It was wonderful to have a local like David with us to really make the history come alive at these 2 stops. After that we headed over to Dovecot Tapestry Studios where we got to learn more about how tapestries like the one Merida’s mom made in the movie. We even got to try our hand at weaving which was very cool. Then we had the evening to enjoy on our own. As much as I love how Adventures by Disney takes care of most of the thinking and planning for you I do also like that they save room for some free time so you can wander the city some more at your own pace. OH how your story makes me want to return to Edinburg…It's been way too long already.